Served warm, these biscuits are fantastic with fresh butter and jam, or on the side with homemade stews or soups. Combine flour, baking powder, and salt in food processor and process briefly to mix. Add the butter and pulse until mixture resembles coarse crumbs. Add the potatoes and egg and process until well blended. Add milk and process until mixture comes together in a sticky ball. Transfer dough to a generously floured work surface and knead until the dough holds its shape. With a rolling pan or by hand, roll or pat to a thickness of about 3/4”. With a biscuit cutter or water-glass, cut into 3” round pieces and transfer to a baking sheet. Brush tops with milk. 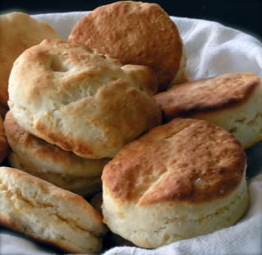 Bake for 18 – 20 minutes, until biscuits are golden brown. Serve warm. This entry was posted in Uncategorized and tagged Bread, Potatoes. Bookmark the permalink.